The STANLEY Rubber Bumper Case has reinforced corners that are designed to protect your phone during those unplanned meetings with the pavement. It includes space to store essentials such as credit cards or a driver's license. Insert your card into the slot on the back to prop up your phone like a kickstand for hands-free use. 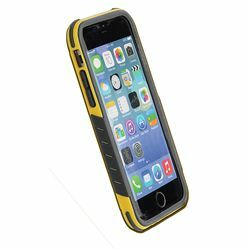 REINFORCED CORNERS - With a ruggedized construction and rubberized corners, this case makes your iPhone virtually indestructible. NO-SLIP GRIP - Silicone pads increase the friction while holding your phone, ensuring a secure, snug hold. IMPACT ABSORBING LINER - An unique rubber coating containing thousands of nano bubbles serve as cushion that absorb shock and provide total protection to your phone. INTEGRATED VOLUME CONTROLS - Ruggedized, silicone volume control buttons are built into the case to allow full control of your phone.